Could you look any more perfect? I love the belt that ties it all together! your lip pop looks fabulous! good gosh you are pretty! You look great! 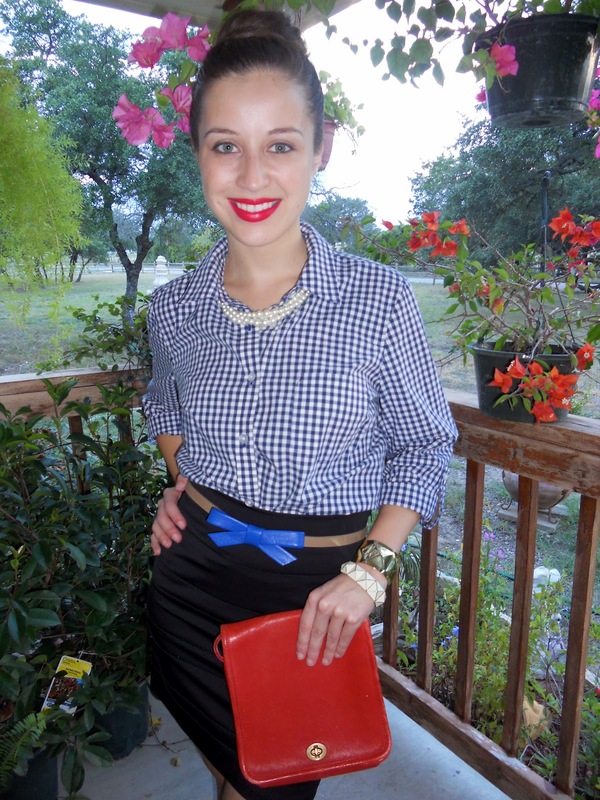 The bow belt and red lips are definitely my favorite part of this look! You look so professional and gorgeous! LOVE this look, so classy! I love that vintage coach bag. Killer outfit! Love your belt. Gorgeous outfit! Loving the great skirt and belt - lovely! Loving the gingham - so cute! Really cute belt and great lipstick. Check out my blog www.sweetestsomethings.com! I love how you dressed up a gingham shirt! Gorgeous. LOVE this look. Your hair always looks so cute like that. Werk Giovanna! I am loving this look, oh and I'm with you! Next year I'm planning to be there! You look so chic and professional! Love it! And that red lipstick makes the outfit really pop. Looking hot! CUTE outfit! And yes, I totally agree. Next year, I'm IN! I'm pretty bummed to not have attended anything in NYC this year! Love this polished look. So gorgeous! And so true about the IFB conference. I definitely have to plan for this next year. Oh I WISH I could go to that conference as well! And just NY in general. You are gorgeous and I love your style! Seriously this look is perfect, love the pop of red lipstick and that blue bow! Ah, I'm dying! Thank you for your sweet comment as well! Really cute! I love the plaid with the pencil skirt. And the red lips make it even more chic. Any excuse to get me to NY is a sign me up! Your looking adorable as always, love the red lips and plaid! Love the skirt and the bow tie belt it is adorable. When you get a chance I'd love if you could check out my blog, I'm new to blogspot. Thanks for your comment on my blog! Love this outfit! Obsessed with that belt! Great fit :) We would love for you to checkout our latest posts when you have a minute! That belt is adorable. This outfit is amazing. Glad I found your blog!! The red lips & red bag are spectacular with the entire outfit!! Your Massimo Dutti belt is SO adorable! that belt is super extra AWESOME with the bits of red! what a great look! tats so tue, a lot of bloggers i knw are at the IFB conf, its on my list for next yr! i loved ur red lips look with the gingham shirt! I definitely like to go to IFB conference next year! Love your cute belt! Loving the bright red with the plaid! You look so classy and gorgeous. Love that little bow belt! Well I'm hoping that by next year I'll have an awesome job (fingers crossed!) so maybe I'll be able to go too. I've always wanted to! 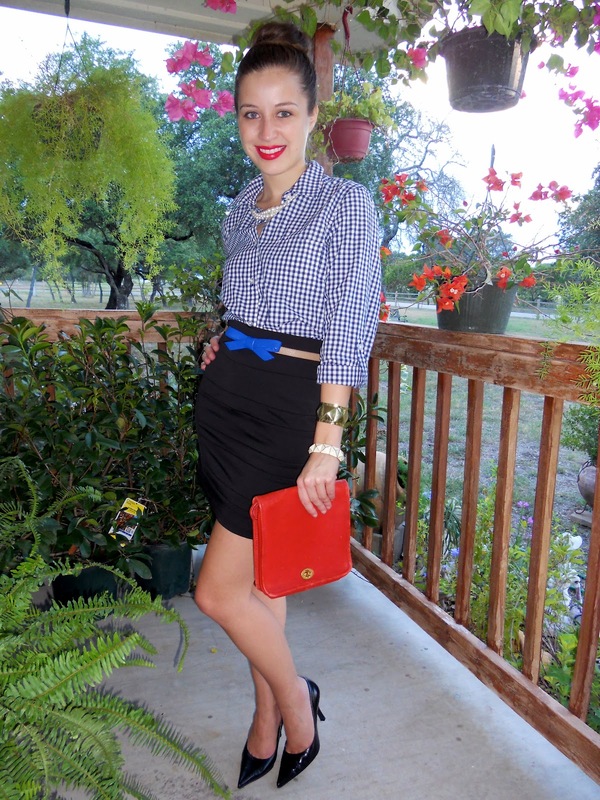 I love this look--pearls and a bow are the perfect feminine accessories for a button-up! I adore your red vintage coach bag! What a fab find! You MUST attend IFB too next year! It was great to do both that and LuckyFABB plus NYFW! Maybe we can meet at the next one. :) Thanks for stopping by my blog! I like to tuck a favorite oversized flannel plaid shirt into a high-waisted vintage skirt for a similar effect! With some big gold earrings ... boho chic.